Waterfront Exec Retreat Rotoiti with heated pool, spa and sauna. Pet friendly. Magnificent property with your own private beach and jetty. 5.5m heated swim spa, infrared sauna and spa pool. Surrounded by tribal land for peace, quiet and privacy. Extraordinary views from numerous outdoor living areas, all bedrooms and living spaces. The rustic, character 3 bedroom, 3 bathroom house is set back off the road 600m and can sleep up to 10 guests plus two extra floor mattresses. Quality hired linen service available at $20pp. Request directly with owner once booked. Tariff includes complimentary bed making. Bedrooms: Master with electric adjustable King bed and ensuite bathroom. Bdm 2 with Superking, single and ensuite bathroom. Bdm 3 with Queen, King single, Rollaway and Single. A wonderful home to enjoy a relaxed holiday for couples or extended families. A memorable Lake Rotoiti experience that is child and pet friendly. All mod cons. Intimate downstairs space for couples or include the spacious upstairs rooms to sleep a total of ten. The site is elevated with a 5 minute walk to a secluded , deep water swimming beach, picnic area and jetty. Any utility vehicle can drive the track or use our complimentary 4wd vehicle. Bush and farm land to explore. Water ski off the beach. Trout fishing or 5 minutes by boat to Manupirua hot mineral pools. Hire kayaks or book a cruise. 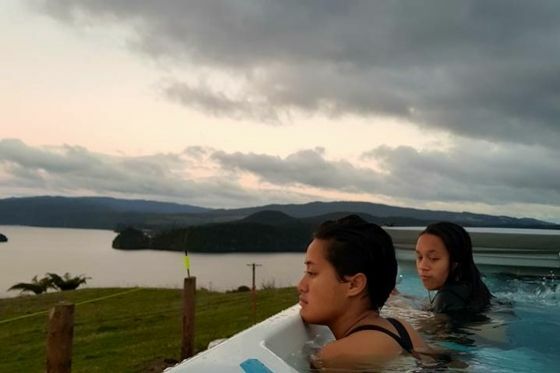 Rotorua top tourist city is 30 minutes away for numerous attractions, white water rafting and cafe 10 minutes, golf and restaurants 15 minutes. Picturesque lake district with lovely bush and river walks or enjoy a true rest like no other. Lake Rotoiti Private sandy beach (sleeps 10-11). Combine with this listing for larger groups. Ref: 20018297. Top central suburb with lovely lake view (sleeps 10-12) Ref: 20032495. Small dogs inside with own bedding. Linen optional. NZ$18.00 per person. Contact owner once booked. Solid, rustic and homely with all mod cons. A no fuss property that can be enjoyed by the whole family; even the family dog. Private beach, jetty, deep clear water swimming, swim spa heated to 30C , infrared sauna and spa pool at 40C will feel like your own private resort winter or summer. QUALITY HIRED LINEN SERVICE AVAILABLE with complimentary bed making. Rotorua City 30 minutes away with all amenities and numerous tourist attractions. Nearest supermarket 15 minutes or mini market 10 minutes. 20 minutes to East Coast beaches. 45 minutes to Mount Maunganui top sandy beaches, surfing, cafes and restaurants. Rotorua Lake Resort 10 minutes away for fine dining. Ramada Resort 10 minutes away for casual dining and breakfast. Rolling hills of absolute quietude. 30 acre property with no neighbours. 400 acres of tribal lands either side of the dwelling. Extraordinary elevated expansive Lake views. Track to idyllic sandy private beach with clear deep water swimming. 3 x outdoor tables. Seat 8, 6 and 4. Book highchair and portacot in advance. 3 x deck areas with furniture for all day sun. 10 minutes away. 9 hole. Championship courses in town. 25 minutes. Electric chair up the 6 steps to the house, then the ground floor and out door decks are wheel chair accessible. A further electric chair lift to the upstairs bedrooms. The car available is a 4wd Toyota RAV for guest use up and down the farm track to the beach. High quality home, beautifully furnished, amazing facilities and perfect views from all rooms. Best Bach we have ever stayed in. A tranquil environment second to none.Thank you for sharing your home with us. Beautiful location. Lots of room to spread out and had a great time. We have totally enjoyed every minute of our stay in this tranquil haven. There really is nothing more one could wish for. Fantastic house, loved the character but modern facilities and so much space! This is a really nice place to stay, very comfortable and very clean! This is a really nice place to stay, very comfortable and very clean! Great views in all directions. The spa was a wonderful winter treat. Our dog loved the paddock and going down to the water. I can only imagine how nice all the porches would be in the summer. If you're like me and have to work while you're away, the fast wifi and office area is great. Rotorua Lake District famous for white water rafting. Great local store with top deli goods, cafe food, and beer garden that hosts local music and events. Fine dining within 10 minutes. Hire a kayak and paddle to natural hot mineral pools or dig a hole to sit in your own bath at the thermal beach. Trout fishing guides, 9 holes of golf or gorgeous bush walks with glow worms at night. 30 minutes from downtown Rotorua, one of New Zealand's top tourist town with numerous attractions.